There has been much talk about raising the minimum wage in the U.S. over the past year. A full time minimum wage job in the US would only pay around $15,000 annually. Minimum wage workers have conducted labor strikes to try and draw attention to the issue in hopes of raising the minimum wage for millions of Americans. This has brought about a fire storm of commentary from the right wing. Some of it valid. Some, not so much. One criticism I’ve heard from the right, is that raising the minimum wage would hurt GDP growth and possibly cause another recession. James Shek and John L. Ligon over at the Heritage foundation claim the following. . . Some proponents of the increase theorize that increased spending power for low-income workers stimulates the economy and offsets these job losses. However, conventional macroeconomic modeling shows that this minimum-wage hike would likely eliminate 300,000 jobs per year and reduce gross domestic product (GDP) by over $40 billion annually. Granted, they were discussing raising the minimum wage to $10.10 an hour, which is roughly a 23% increase over the national average. Nevertheless, the takeaway from the article is that a raising the minimum wage is bad for GDP, which in turn is bad for the economy. While this is intriguing, why just site a model? Surely somewhere in the world there is a country where raising the minimum wage happens on a fairly frequent basis. We could take a look at that countries GDP growth over that time and see if the Heritage model holds true. A good example is our friends in Australia. They have a long history of minimum wage standards dating back to the 19th century. Currently the minimum wage in Australia is $16.87 an hour. Taking that minimum wage and using the Organisation for Economic Co-operation and Development (OECD) comparative price levels for 2014, a minimum wage worker in the U.S. would have the purchasing equivalent of $24,000. That’s almost 40% more purchasing power than a minimum wage worker in the U.S. Using the OECD purchasing power data from 1990-2013 for both countries gives the following chart adjusted to 2012 U.S. purchasing dollars. Surely they must be on the verge of economic collapse, according to the models they have at Heritage. 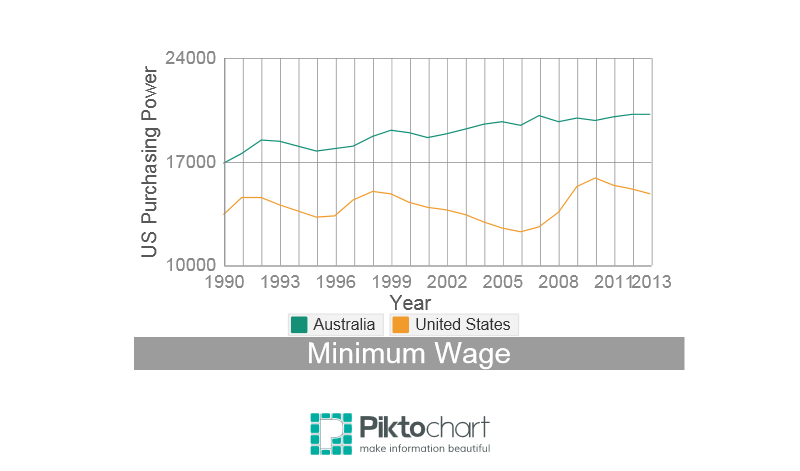 They have been consistently raising the minimum wage over the years covered in the chart. Keep in mind that this is relative to prices and inflation as well. This means minimum wage workers on average received raises that actually increased their purchasing power. On the other hand U.S. minimum wage workers had long stretches where they lost money to inflation. Let’s take a look at GDP of both countries to see if the Heritage Foundation is correct. With raising the purchasing power of the minimum wage every year, their model would have to show GDP going negative quite a few times. Well look at that. 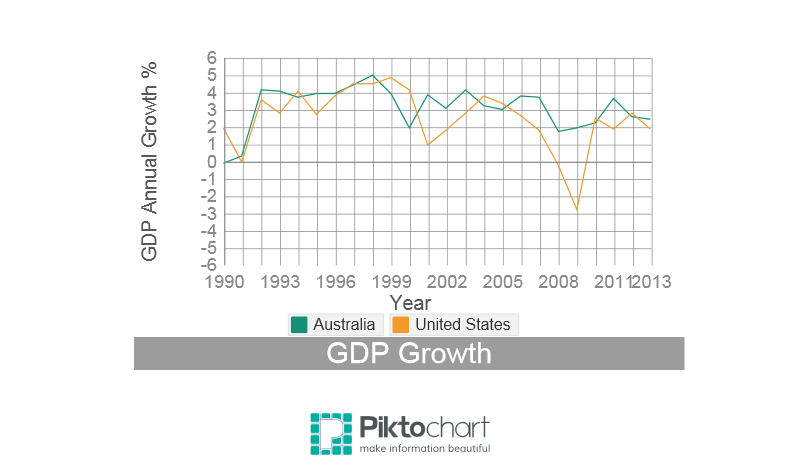 It seems that Australia has had a fairly consistent GDP growth year after year. Over that time Australia averaged a higher GDP growth than in the U.S. where the minimum wage has mostly been in decline. The most interesting fact from the graph is that it seems no one invited Australia to the economic meltdown much of the world faced within the last half decade. There is a slight decline in growth, but GDP was positive overall. The same can’t be said for the U.S. where annual growth in 2009 almost dipped to negative 3%. Please don’t think I’m saying that raising the minimum wage is the ointment that will keep recessions away. I’m merely pointing out that raising the minimum wage will not send the economy into a fiery tailspin. And yes, perhaps some low wage workers will lose jobs at first, but there will be a lot of purchasing power in the hands of people that can’t afford to save money. That means an increase in demand, which could require the hiring of more people. Another thing I would like to stress is that Australia’s success doesn’t necessarily mean raising the minimum wage will lead to a more stable GDP. It’s possible, but there is hardly enough evidence in these two charts to prove that. The fact of the matter is that Australia has been able to enact economic policies that navigated them through some tough economic times. Maybe the world could learn a thing or two from them when it comes to economic policies. In the U.S. we just crawled out from trouble economic times. Corporations are now seeing record profits, and the stock market is reaching new highs. However, the median household is still behind in terms of real income. People are starting to realize that they are working harder and longer for less money. As I pointed out in an earlier post, in the past 30 years real median income has only gone up 10%. This essentially means that if you make $50,000 a year, then your annual raise would be $165 dollars. Over that time GDP has more than doubled in real dollars, and the average American has seen little in return for all their hard work. Something needs to happen to get money back in the hands of people, perhaps raising the minimum wage to something people can survive on is the first step.